When you’re beginning to blog, you should know that it’s a marathon and not a race. You’d think the income from blogging would come naturally once you start writing and publishing content. It doesn’t work that way. Before earning from your blog, you must set up its foundations. Putting the right pieces together before you execute your plan allows you to track your performance. You can see which tactics worked and didn’t so you can tweak your strategy as you see fit. From there, it’ll take more than half a year before you see the results. You must be diligent and consistent in running your blog so you can reap the rewards soon. While blogging success is not easy, it is possible nonetheless. If you’re starting a blog and need guidance on how to get the most from it, then read the tips below. Are they anything else you need to know when beginning to blog? Starting up a blog may be cheaper than more traditional forms of going into business. But that doesn’t mean you don’t need any money at all. You need to invest in a laptop, photography equipment, domain, hosting, and theme. Not to mention the cost of the products you paid for the review until you get enough followers. To save costs, some bootstrap and fund their blog themselves. However, you should be in the position to have all the money you need just lying around. If not, then you need to find another way to generate the required finances. Luckily, there are some options that you can try including investing money in the stock market. Something that product like algo trading can make a lot less risky. Alternatively, you may wish to get work online as a copywriter or even SEO specialist. Something that can help you earn on the side and expose you to valuable experiences regarding writing and optimizing blogs. You can then apply your experience to your blog once you get up and running. In the very beginning stage of your blog, it’s crucial to create a plan of what you will discuss on your site. The content you will write will determine how you will generate an income. It also helps narrow down the demographics you will target and encourage followers to interact with your material. The best advice here is to look to someone that has already done this successfully for guidance. You can get lots of information from this post here and by following your favorite bloggers. Target the ones who blog about blogging. This is usually filled with informational gold that can help you get set up quickly and effectively. The key to greater blog traffic is by optimizing your content for keywords with high traffic and low competition. This SEO strategy is the cornerstone of every successful blog. After all, you can’t just write content and expect people to come. You need to strategize by gathering keywords that will help generate the most blog traffic. You can research these keywords using a tool like Keyword Revealer*. Type in your blog topic to unearth hundreds of suggestions to write on your blog. You can also check the keyword difficulty to see how easy to rank for it on search results. This tool should help you develop an editorial calendar containing the best keywords you must write about on your blog. Believe it or not, keyword research is the easy part of planning for your blog. The next step is creating content that resonates with your audience. I have detailed in this post how I write content that helped me land clients as a freelancer. You can apply the same tenets in writing your articles. Plan and research – Always develop an outline for all the posts you will write. Also, include research materials to help support the claims in your article. Use editing tools – Get help from tools like Grammarly Premium* to avoid grammar mistakes you missed while editing your content. Use different types of content – Add or embed images, videos, and podcasts to make your content more dynamic. Format your posts – Use subheadings to organize your post into different sections. Determine your call to action – Enforce the purpose of your post at the end. Ask them to comment, join your email list, buy your products, and others. When starting a blog, you must be aware that content is never enough. No matter how good it is, nobody will read it unless they know it exists. Therefore, you need to promote your content on channels where your audience frequents. Sharing your content on these platforms help you build awareness about your blog. Doing it consistently also allows you to breed familiarity among your audience. This ultimately encourages them to read your blog post and hopefully become its fan. If you don’t know the platforms where to promote your blog post, I’ve listed down the best ones here. Create an account on each site and share your most relevant content there. When first starting a blog online, you need to educate yourself on how to create quality, valued content. Each piece you write needs to solve a problem or answer a question that your audience wants to know. However, how could you possibly know what it means to create “quality” and “valued” content? It’s one thing to be aware of the things that make your content such. It’s another if your audience thinks so or not. This reason is why you need to measure your blog’s performance. A metric to measure is the number of blog visitors you generate in a period. Obviously, the more visitors your blog garners, the merrier. If you’re not getting enough traffic, then something is wrong. However, website traffic is just the tip of the iceberg. There are other variables you need to track to understand how your posts are performing and how you can improve them. You also need to use the right tools to help make sense of the data in front of you. This guide about website analytics should help you get started with tracking your blog. To be honest, there’s a lot more to know and discover about starting a blog. However, it’s best to let you live through them and get to know them at your own pace. Blogging is a journey. You can’t know everything all at the same time. You must take it one step at the time before you’re ready for the next challenges. 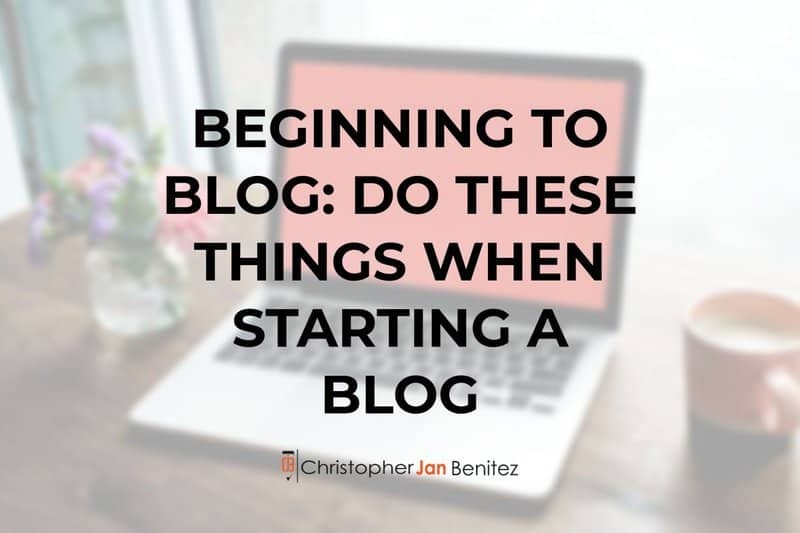 In the meantime, the tips above should help prepare for the obstacles ahead if you’re beginning to blog. Stick to these foundations to ensure that your blog will be ripe for success. Long Tail Pro Review: The Best Keyword Research Tool Ever?